I would be remiss to not mention what happened in Boston this week. Having lived there - and worked just a couple blocks from the explosions - I know that Bostonians strong and amazing people. But that doesn't stop my heart from hurting for them and wondering how anyone could do this on such a fun and happy day/event. My thoughts and prayers are in Boston this week. Our living room got a bit of a new look last weekend. If you remember, Chris bought me a beautiful leather chesterfield sofa for Christmas. We've been storing it in the garage for the last few months while we finished the kitchen and the church basement. Right around the same time, my parents were getting rid of a HUGE ottoman, so I snagged it. It's been living in our basement. But, we finally moved both into the living room this weekend! Last week our living room looked like this. The good news is that I LOVE the couch. So gorgeous. And, so comfortable. The bad news is that ... I have no idea how to layout the living room now! I think I may need to rethink furniture. I love it too, but I'm worried that the problem with the whole set up is the size of the ottoman - it's pretty huge! We moved both in on Saturday and had friends over that night. We all agreed the space it tight, but as we were sitting there after dinner, we all agreed that the ottoman is awesome because it's nice to have some place to kick back and put your feet up. Let's look from a different angle. I added the bookcase because looking at the back of the couch was just awkward. And this angle is taken from the door. So when you walk in, this is what you see. Is it bad luck/bad feng shui to walk into the back of the couch? I feel like it might not be very welcoming! Of course the bookcase would be styled (and it's already dusted - ew! It's been in the basement for over a year!) 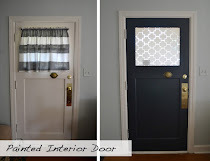 and it sort of creates a little entryway. 1. 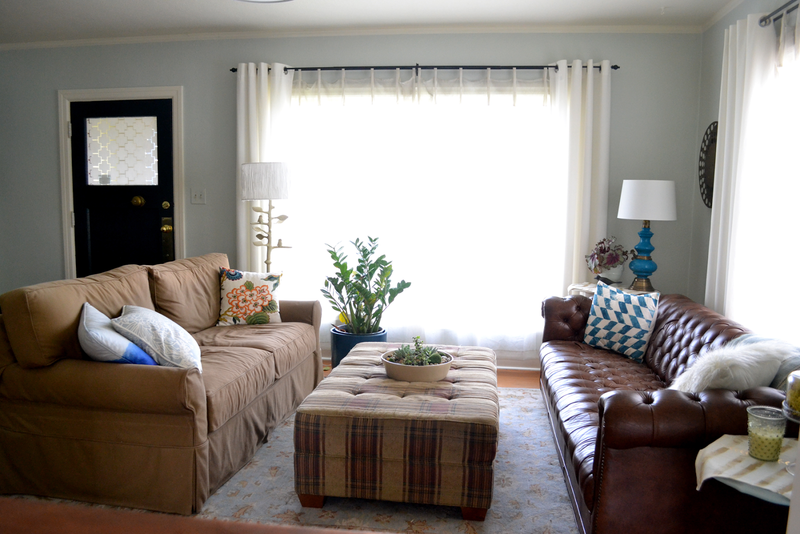 My original thought - keep it as is and get a new slipcover for the old couch (too much brown!) 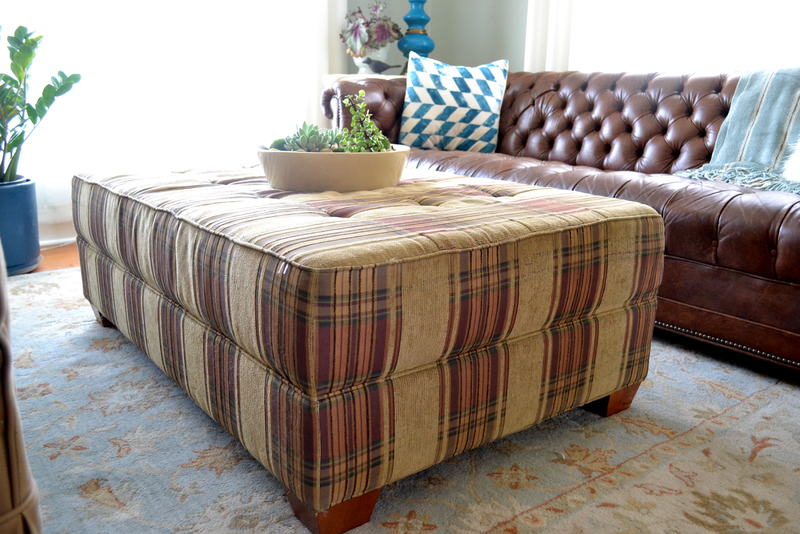 and recover the ottoman with a fun graphic pattern. 2. Keep the ottoman and find a couple of chairs to go where the old couch is currently. Maybe the ottoman wouldn't seem as big if there were chairs, which allow for more walking space? 3. Get rid of the couch and the ottoman and find something smaller. I vote keep the new couch and ottoman (covered of course) but get rid of the couch blocking the walk in. Have perhaps two more open chairs making a convo circle but not making it feel so tight. Kitchen looks great btw!!! Option 2 for sure! The size and scale of the ottoman are good with the Chesterfield. I could see a couple of cool, comfy Mid Century chairs really making the space come together! Crazy about the Chesterfield!!! My first thought was get rid of the old couch and replace with 2 chairs but then that last shot of your LR...could you put the old couch in front of the front window? Kind of an L-shaped configuration with your furniture? Don't know...just a thought. I vote for option 2! If you do end up keeping both sofas, what about flipping them? The chesterfield looks shorter and if it's in the middle of the room, the room might feel more open. I also think a longer console behind the sofa might be nice. The bookcase there seems like it may be just a bit too short width-wise. I think the most important thing is that the configuration work for you guys... no matter what we suggest. With that in mind, I think the idea of two chairs replacing the tan couch is a good one. It would also make it really easy for people to to get cozy in front of the fireplace (if the fireplace is workable, that is:). That ottomon is great but I wonder if something a little narrower would work better? Like maybe you could find an upholstered bench that would still be comfy for feet-propping, but would take up less space visually (esp. if it had long legs). Just brainstorming. 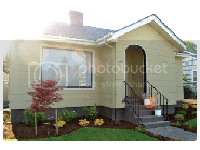 It's always easier to come up with ideas for other peoples houses... lol. The chesterfield is beautiful! Our house is the same way - the front door just dumps you into the living room. It makes it a little awkward to furnish. I guess I would probably try option 2. But I might also try option 2 with the chesterfield against the front window and the two chair backs facing the kitchen (spread out a little). I like the scale of the ottoman with the new couch, so I'd probably try to make it work! I absolutely adore that couch. I think the couches with the ottoman is too heavy. If it were me, I'd remove the second couch and put the chairs back, to create an openness. I agree with the whole two-chairs-recover-the-ottoman idea. Would look great no matter how you arranged it! I love the new couch! 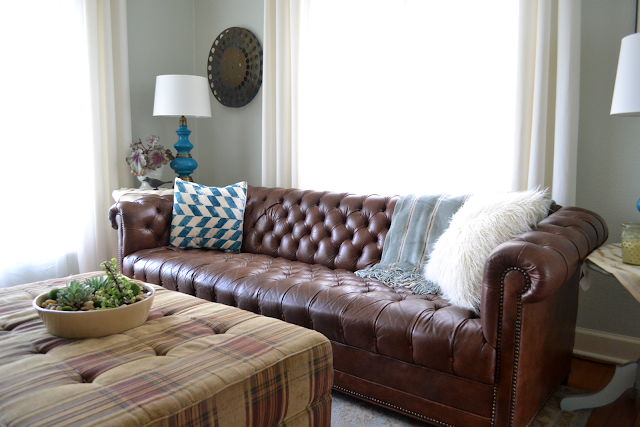 I'd say put the old couch perpendicular to the leather one and have it recovered in a deep blue then get the ottoman done in a fab blue pattern. It would go well with your current colour scheme as well. EVERYTHING looks so fantastic! I have an over sized ottoman like this, it is wonderful. You must be so proud of everything.... such hard work. Congrats!! 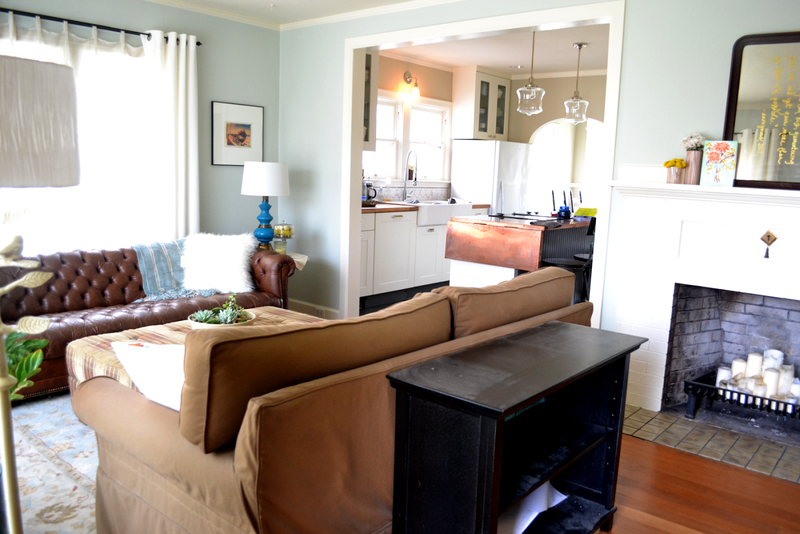 If you're looking for more seating, it's really nice to have 2 couches. How about putting the one in the middle of the room against the other window? You could get a new slipcover as well to go with the chair(s). The chair(s) could go in the middle of the room. I think one could even work if it was visual enough. And I love the big ottoman...yes recovered. I found you through portland bloggers...which I never knew about before! It will be fun to join up with you guys. Definitely #2 I think two chairs will definitely open this up a bit and not feel so closed in. Plus you have that beautiful fireplace that with a few chairs could still be a focal point. Big kudos to Chris - that Chesterfield is HOT. It's such a great piece. And the ottoman...could you get your man to cut it down into 2 ottomans? I think it's great but I think having the ability to have 2 smaller ottomans to place together or move apart if you want gives you more flexibility for entertaining (but still not losing any of the surface area to lounge, place drinks, sit, whatever). 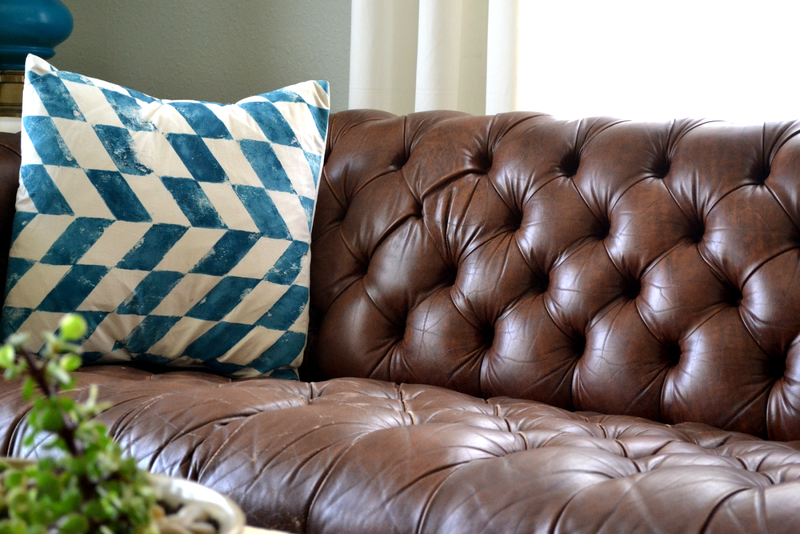 I love the leather sofa!! Of your three options, I like 2 the best. However, I also like the suggestion of putting one sofa against the window. 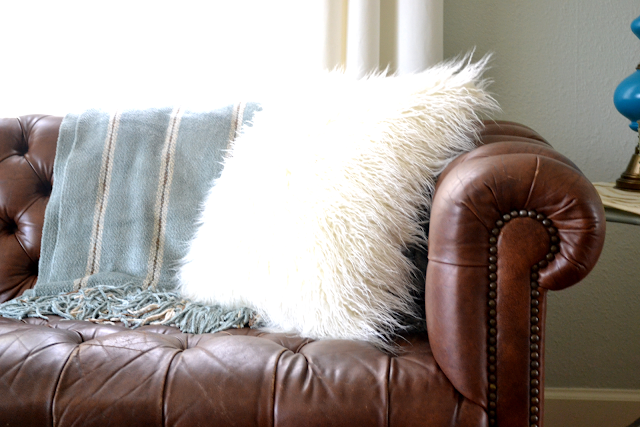 Definitely a new slipcover would be nice to break up all the brown. Another thought - I feel like in an ideal world, if you had furniture against the back of the brown fabric sofa, it would be best to have a sofa table or something that was wider. I feel like the bookshelf is too small against the back. Of course you could keep the bookshelf there but add a floor lamp or something to flesh it out. . . but that might become too cluttered. It's so awkward how these old ranches just dump you in the living room. Wow really gorgeous. Stunning pics. I love to find such a nice post!! 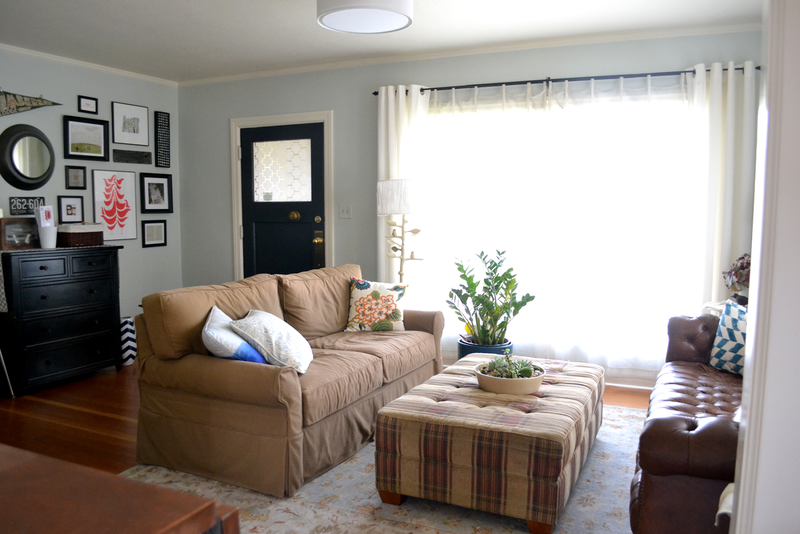 There are lots of ideas to be put when your renovating your living room. Just play and display. 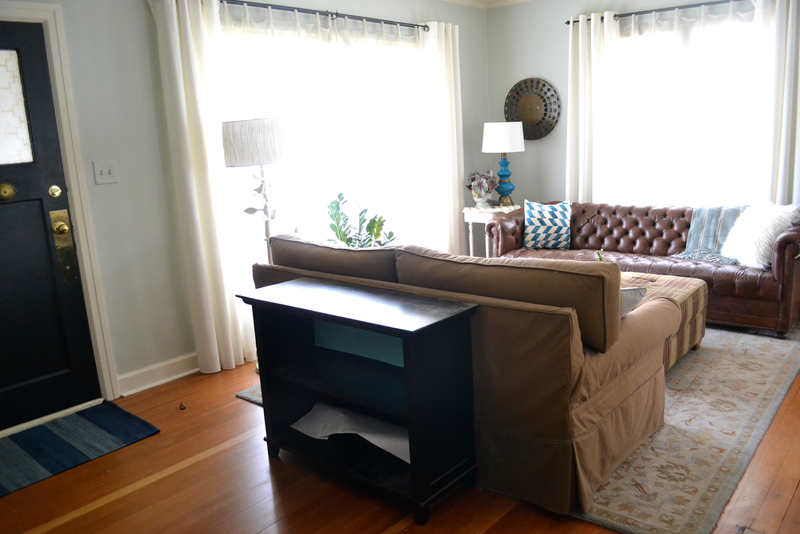 I would move the slipcovered couch underneath the window to create an L shape with the chesterfield, ditch the ottoman for something with better proportions (although it is cool) and get two chairs to put where the slipcovered couch is now. It will still create some separation with the entry but not close it in too much. That will be a beautiful room. I would move the slipcovered sofa under the window to create an L shape with the chesterfield, ditch the ottoman (although it is cool)! for something with better proportions (unless it does work with the L shape) and get two chairs facing in where the slipcovered sofa is. That will still create some separation with the entry but not close it in. It looks really great and I think a little re-arranging is worth a try.